An unmissable tour upon the discovery of Palermo, one of Italy's most beautiful cities with its history and millennial old culture, where Norman, Greek, Roman, Arab and Byzantine influences all fuse together. Departing from the port of Palermo, we will set off on a short sightseeing tour by coach to get an overall picture of the city. We will arrive at the Palatine Chapel, the famous basilica with three naves dedicated to St Peter the apostle which is found inside the architectural building of the Palace of the Normans. The Palatine Chapel was built in 1130 upon the orders of King Roger II of Sicily and ever since 2015 has been declared a UNESCO World Heritage Site. Wandering around inside, it feels as if we have gone back in time to the 12th Century, to discover the history of Sicily's kings: we can admire the dome, the transept and the apses completely adorned from the top by splendid Byzantine mosaics against a gold background, amongst the largest on the island and which depict the blessed Christ Pantocrator, the evangelists and various biblical scenes. After the visit to the Palatine Chapel, we will continue our tour by coach to the ancient district of Kalsa, built during Islamic rule, which was once a fortified city where the emir and his ministers lived. Today, it still upholds an eastern atmosphere heightened by the presence of Arab-Norman style monuments. Here, we can visit Magione Church, built by Matteo d'Ajello in the Romanesque style during the 17th Century, the aforementioned a notary working for the Norman sovereigns, with its cloister and the Church of Spasimo, which was built in 1506 and which housed, for about quarter of a century, a painting by Raphael (Christ Falling on the Way to Calvary) presently held at the Prado Museum in Madrid. 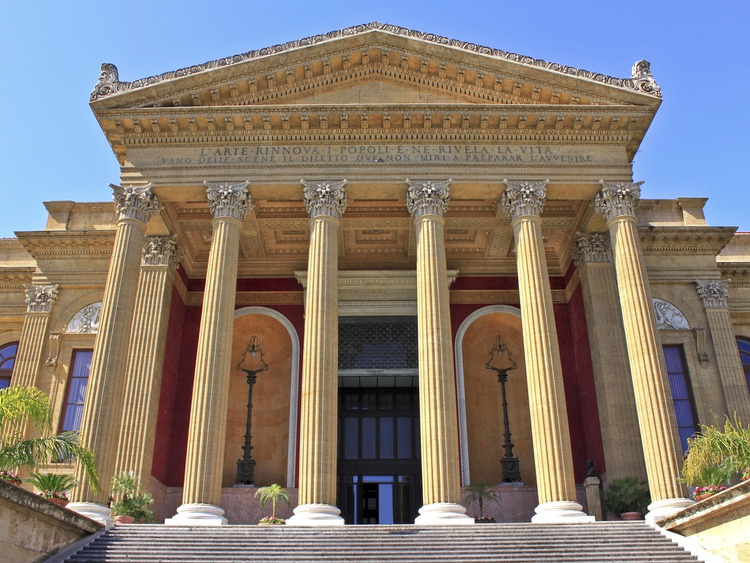 Before returning to the ship, we will stop at Teatro Massimo, the largest lyrical theatre in Italy, and one of the largest in Europe, third largest in terms of architectural scale after the National Opera of Paris and Staatsoper in Vienna. We will have some free time to purchase souvenirs.